Something new I learnt, sharing with the readers. Some may call the Television and idiot box but I have learnt many things from my years of TV addiction. As a child I understood the difference between sausage, ham and steak because of the Tom and Jerry cartoons. I knew what a jet pack was because of Jetsons. And before Jurassic Park, dinosaurs were not alien to me because of the Flintstones. Now, with the TV actually turning into a source of mediocre forms of entertainment, I focus more on TV Series, from America and UK. I have learned about Tracheotomy from House M.D. and such other trivia. Recently I have been watching a few series which have a lingering theme in them, it makes sense to have that common thread run through them because they are also part of the same Marvel Universe. Yes, I am talking about the series of The Flash, Arrow, Supergirl, Legends of tomorrow. Combine that with my tryst with Doctor Strange in the theaters, this one concept has been intriguing me. The same theory was mentioned in The Big Bang Theory, as something Sheldon believes in, which got me thinking, Multiverse theory is not just part of comic books it is possibly something scientific. Then I re watched Interstellar and as with all Christopher Nolan movies, each time you watch them you become aware of a nuance you had missed earlier. This Multiverse theory was everywhere. Like all millennials, if I can call myself that, I turned to the internet for my answers.Here is some basics about what is Multiverse? The multiverse (or meta-universe) is the hypothetical set of possible universes, including the universe in which we live. Together, these universes comprise everything that exists: the entirety of space, time, matter, energy, and the physical laws and constants that describe them. The various universes within the multiverse are called “parallel universes”, “other universes” or “alternative universes”. This comes from Wikipedia and for more details do check out the link here. In fact most of the comics characters we have grown up with from DC comics and Marvel comics have always been intermingling the stories from their different worlds sometimes bringing all the superheroes into the same world and time. Hence, we have the Avengers and Justice League. One is given more story lines and better stories with this intersection of time and space but sometimes, too much playing around with the time and space concepts can hurt your head in the audience trying to understand everything that is going on. In fact 2017 Oscar nominated movie Arrival also speaks about it to some degree, not the multi verse theory as such but the concept of Non linear time. The same kind of concept of time, was referred to in Interstellar. Our understanding of time is linear, currently, in some future time or in the case of Alien travelling across the universe to meet us may see and understand time in a non linear fashion. Here is link on the Linear vs Non Linear view of time. The more I am reading about this, the more I am intrigued and after watching Arrival, I am beginning to grasp the concepts much better. Of course, one must understand that these are theories which have several anti-theories too. But for the time being this science fiction and comic book fan is happy. I am a cat lover , doesn’t mean I am a dog hater, I like them both but I love cats. Here is an interesting bit of information I gathered while prowling on the internet. 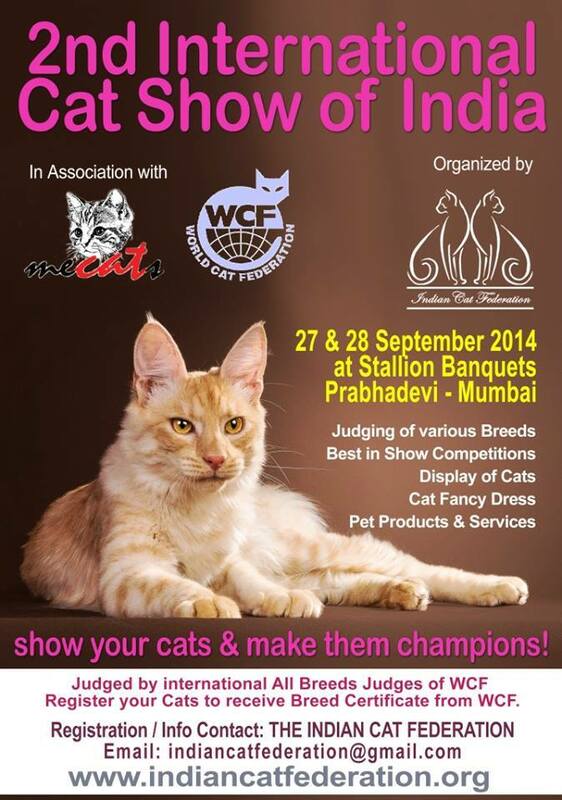 The Indian Cat Federation has been formed to provide much needed support to the Cat owners and Breeders in India. The ICF is a National body recognized by The World Cat Federation (WCF). There are millions of Cat lovers in India and the Breeders of Pedigree Cats are growing rapidly. The role of ICF will be to increase awareness about the various aspects of Pet care for all types of Cats in the Country. WCF has over 30 years of Experience to provide overall Cat care. How about that? Isn’t it a fabulous bit of news to have for cat lovers. And what’s more there are cat shows too. In case you are in Delhi/NCR and you are a Cat Lover, check this out. I do love cats… TIME they got a bit of the limelight. Tintin and his adventures have been part of my childhood and given me the happiest moments during the summer breaks of buying a comics and then reading it. Each time I was given a new Tintin comics it meant time to revise the previous ones. I never read the comics in the order they were published till recently when I got the digital version of the comics series. Since then I have been reading up a bit about the character of Tintin, his creation, the role model of the creator Herge` and also about the other recurring characters in the world of Tintin. Apart from Tintin the character of Captain Haddock is my favorite. Here I bring to the readers a compilation of some rare , interesting facts and stories around the comic book hero, Tintin. Georges Remi was born in Brussels, Belgium, in 1907. Although he would go on to be one of the world’s most iconic cartoonists, Georges was not a particularly standout student as a young boy. Instead, he preferred to indulge in his love for adventure and games with his friends on the streets of Brussels. In secondary school, he joined the Boy Scouts. His drawing skills quickly caught the attention of the Scout leaders, and it wasn’t long before he was illustrating a Scout magazine and creating his first characters. After leaving school and beginning work at the Belgian newspaper Le Vingtième Siècle, Hergé oversaw a weekly supplement for children entitled Le Petit Vingtième. This got him thinking about a new character: “The little brother of Totor, a Totor-turned-journalist, yet with the spirit of a Boy Scout.” Hergé’s job provided him access to all the latest news, including the real-life exploits of French reporter and investigator Albert Londres. Londres’s career, as well as stories from Belgian and foreign papers, became fodder for Tintin’s adventures. Tintin himself was modeled after Totor, with a round head, a button for a nose and two dots for eyes — but with the iconic quiff that makes him instantly recognizable. Hergé drew inspiration for his star character from the career of the French foreign correspondent Albert Londres. A pioneer of investigative journalism, Londres traveled the world to uncover the truth behind business, politics, governments and the criminal underworld. Tintin represented the reporter that Hergé himself would have liked to be. Tintin’s features are simple: a round head, a button for a nose, two dots for eyes and a quiff. This is the key to his success. He is flexible, distinctive yet anonymous: any child or adult, of any age or culture, can identify with him. Although he starts out as an investigative reporter, Tintin develops into a detective. Snowy and others regularly refer to him as Sherlock Holmes, and he has a good deal of the famous English detective about him, including a sharp eye for detail and considerable powers of deduction. Like Holmes, Tintin is a master of disguise! A bit like James Bond, there is no car, motorcycle, locomotive, submarine, airplane, helicopter, horse or camel that Tintin cannot drive, ride, steer or fly. In Tintin in the Land of the Soviets, he carves an airplane propeller from a tree using a pocketknife. In Cigars of the Pharaoh, he fashions a wooden trumpet with which to communicate with the elephants. No matter what situation Tintin finds himself in, he’s never at a loss for what to do. Tintin wholeheartedly embraces the role of the explorer, which culminates in his most memorable achievement — taking the first steps on the moon, some 16 years before the American astronaut Neil Armstrong. By this time, it is clear that Tintin has ceased to report news and is instead making it. The Tintin books have been translated into over 100 languages. In German he is called Tim, in Turkish he is called Tenten and in Latin he is known as Titinus. Snowy is Tintin’s faithful companion, traversing continents with his adventurous master and saving his life on numerous occasions. Throughout all 24 Tintin adventures, reporter and dog are inseparable. Hergé named Tintin’s faithful companion after his first girlfriend, whose nickname was “Milou” (Snowy’s name in the French-language versions of Tintin). Hergé chose a fox terrier as Tintin’s canine companion. At the time, the fox terrier was popular for its character and intelligence — attributes abundantly evident in Snowy. Additionally, the landlord of a restaurant Hergé frequented was the proud owner of a fox terrier, and his dog became the inspiration for Snowy. In all likelihood, however, the landlord’s dog didn’t talk. In that way, Snowy is very much his own dog! While heroic and intelligent, Snowy is still very much a dog. In The Shooting Star, he lies contentedly asleep, his stomach full of sausages. In The Black Island, he picks up a roast chicken from the British Rail restaurant car as Tintin rushes through in pursuit of villains. When faced with the choice between helping his companion and enjoying a delicious bone in King Ottokar’s Sceptre, Snowy hesitates just a bit before he chooses Tintin and saves the day. Snowy proves his bravery on numerous occasions. He is a fighter with true terrier traits and is undeterred by bigger, fiercer dogs, lions, cheetahs, goats, gorillas or evil humans. Tintin can depend on his loyalty and impressive initiative, whether neutralizing high explosives by simply cocking his leg, or repeatedly freeing his master from his bonds. Despite his courage, there is one thing Snowy is afraid of — spiders. When Captain Haddock makes his debut in The Crab with the Golden Claws, he makes quite an impression. First, he nearly puts an end to Tintin by burning the oars of their lifeboat to keep warm. As if that weren’t enough, he cracks Tintin over the head with a bottle as he’s piloting an aircraft, causing it to crash in the desert. Despite this inauspicious beginning, the captain goes on to become Tintin’s closest friend. As the stories progress, Captain Haddock proves himself to be much more than a clumsy, hotheaded sea captain with a colorful vocabulary. He is clearly a highly competent mariner and navigator, and his years of experience on the high seas prove invaluable in numerous adventures, including The Red Sea Shark. As Hergé was considering names for his new character, he asked his wife, Germaine, what she had cooked for dinner. She told him, “a sad English fish — haddock.” Hergé thought it a perfect name for Tintin’s new mariner friend. Thomson & Thompson, the world’s clumsiest policemen, make their first appearance in Cigars of the Pharaoh. Apart from Tintin and Snowy, they are the longest-running characters in the series, appearing in 20 of the 24 Tintin books. Despite the fact that they spend most of their time failing to solve crimes, dressing up in hopeless disguises and falling flat on their faces, Thomson and Thompson always end up on Tintin’s side, even if they do have to arrest him first! Hergé’s father, Alexis Remi, had a twin brother named Léon. The brothers sometimes dressed in similar hats and suits when they went out together with walking sticks in hand. They even liked to repeat the French equivalent of Thomson & Thompson’s catchphrase: “To be precise!” It seems that the men’s antics made an impression on the young Georges Remi. The dim-witted detectives bring the slapstick comedy of Charlie Chaplin — whose films Hergé knew well — to the world of Tintin. As the reporter’s adventures continue, Thomson & Thompson’s whining and petty arguing bring to mind another pair of bowler-hatted buffoons: Laurel and Hardy. Although Herge` was inspired by many personalities around him for drawing his characters, he did extensive research for his stories based in different countries. For any child growing up amid the political and cultural changes of the twentieth century, Tintin was a role model who both inspired and delighted. Hergé drew upon the political events of the time and dedicated his life to creating adventures that transported readers to places around the world — from Japanese-occupied China in The Blue Lotus to the Arctic Ocean in The Shooting Star. Throughout his career, Hergé strove to bring as much of the real world as he could into the world of Tintin. Hergé’s extensive research began with The Blue Lotus; Hergé stated, “It was from that time that I undertook research and really interested myself in the people and countries to which I sent Tintin, out of a sense of responsibility to my readers”. Hergé’s use of research and photographic reference allowed him to build a realised universe for Tintin, going so far as to create fictionalised countries, dressing them with specific political cultures. These were heavily informed by the cultures evident in Hergé’s lifetime. Pierre Skilling has asserted that Hergé saw monarchy as “the legitimate form of government”, noting that democratic “values seem underrepresented in [such] a classic Franco-Belgian strip”.Syldavia in particular is described in considerable detail, Hergé creating a history, customs, and a language, which is actually a Slavian-looking transcript of Marols, the Flemish dialect of Brussels. He set the country in the Balkans, and it is, by his own admission, modelled after Albania.The country finds itself threatened by neighbouring Borduria with an attempted annexation appearing in King Ottokar’s Sceptre. This situation parallels theItalian conquest of Albania and of Czechoslovakia and Austria by expansionist Nazi Germany prior to World War II. Hergé’s use of research would include months of preparation for Tintin’s voyage to the moon in the two-part storyline spread acrossDestination Moon and Explorers on the Moon. His research for the storyline was noted in New Scientist: “The considerable research undertaken by Hergé enabled him to come very close to the type of space suit that would be used in future Moon exploration, although his portrayal of the type of rocket that was actually used was a long way off the mark”. The moon rocket is based on the German V-2rockets. As I sit and read through the ideology behind the stories and adventures of Tintin I can already foresee a another post about him soon. Till then why don’t you tell me which are you favorite Tintin Adventures. I have been re-visiting [read as watching House. M.D. the TV series]. I have referred to the character of Gregory House once before in a post and today’s post will delve into the similarity I find between the House and Sherlock Holmes. I found the internet littered with many such blog posts and discussion. Many others have reached similar conclusions like me. I only mean to add to those contentions and discussions with no attempt to plagiarize their ideas. I would like to state that my comments here are the result of watching and researching House and Holmes over the past few weeks. A little bit about House, M.D. for everyone just in case you don’t know about him. House (also known as House, M.D.) is an American television medical drama that originally ran on the Fox network for eight seasons, from November 16, 2004 to May 21, 2012. The show’s main character is Dr. Gregory House, a pain medication-dependent, unconventional, misanthropic medical genius who leads a team of diagnosticians at the fictional Princeton–Plainsboro Teaching Hospital (PPTH) in New Jersey. The show’s premise originated with Paul Attanasio, while David Shore, who is credited as creator, was primarily responsible for the conception of the title character. House was among the top-ten rated shows in the United States from its second through its fourth season. Distributed to 66 countries, House was the most watched television program in the world in 2008. The show received numerous awards, including five Primetime Emmy Awards, two Golden Globe Awards, a Peabody Award, and nine People’s Choice Awards. On February 8, 2012, Fox announced that the eighth season, then in progress, would be House′s last. The series finale aired on May 21, 2012, following an hour-long retrospective. Hugh Laurie is an English actor, comedian, writer, musician, and director, who played the role of House. Did you know in the 2011 Guinness World Records he was listed as the most watched leading man on television and was one of the highest-paid actors in a television drama, earning £250,000 ($409,000) per episode in House? It is well known that the creator of the series David Shore has said in his interview to have been inspired by Sherlock Holmes when writing the character of House. That there will be similarities between the two characters is thus obvious. Here is a compiled list of similarities between House and Holmes. Name: the name “House” is a play on “Holmes” – with English pronunciation, a homophone for “homes”. Expertise: Holmes has his ‘deductive reasoning’ & House his ‘differential diagnosis’. They are experts who are brought into cases that have proven too difficult for other investigators. Powers & Abilities: exhibit remarkable powers of observation and deduction, rapid conclusions after the briefest examination of the circumstances. Weakness: Drug use – Vicodin (a pain medication) for House and Morphine & Cocaine (for research and recreationally) for Holmes. Talent: playing musical instrument – Holmes plays the Violin, House plays the piano, guitar and Harmonica. Friendship: Dr. Watson for Holmes and Dr. Wilson for House – similarity in names and both are roommates for considerable time. The Watson’s and Wilson’s play second fiddle to the lead characters. They bring or try to bring a stability to the unstable main characters. House Number: 221B, both live at the similar number house/apartment. Attitude: they are indifferent to their clients/patient and see them only as a puzzle that needs to be solved. Character flaws: Narcissistic, un-social, rubbing people the wrong way, doesn’t adhere to social customs. The last is a connection between the character of Dr. Watson and House, both have a problem with their leg and thus walk with a cane. Watson’s war wounds and House’s Infraction in the leg have left them in pain. The complex character of Dr. House is my favorite in medical drama series trumping ER, General Hospital and Grey’s Anatomy. In the episode titled, “It’s a Wonderful Lie”, House receives a second-edition Arthur Conan Doyle as one of his Secret Santa gifts. In the episode titled, “Joy to the World”, Wilson refers to an “Irene Adler” (calling her House’s one true love) when he is talking with Taub and Kutner about why he threw away a valuable gift (that valuable gift being a rare medical text on diagnosis written by a “Dr. Joseph Bell”). Did you know several House alumni have appeared on the CBS series “Elementary”? Lisa Edelstein who is Dr. Cuddy in House, played a murder suspect in Season 1 of “Elementary”. Tell me if you like House, M.D. Reference Sources: Wikipedia, iMDb, Discussion Forum for House, M.D.